In the quest to know more about the coming of Chinese to India, we remember that the first group of Chinese came to India led by Chang Ah Chew. 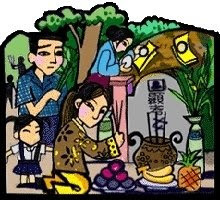 In order to gather some more information, we decided to go and pay a visit to the Hokkien cemetery with the hope to gather some definite dates on these people and other important data. Six members of the Chinese community visited the cemetery at Ghoshbagan near the old number 38 bus terminal known as Mathpukur. We were in for a shock as we entered the premises. The once beautiful and traditionally well-kept cemetery was not there anymore. What remained was shambled ground surrounded by few constructed houses spread about with people living in them. We could not find any complete tomb structures with the beautiful layout on a respectful atmosphere. We were dumbfounded with what we saw. We got into the ground not through a gateway but by a narrow lane of about 3 feet wide, between the walls of standing buildings. And the greatest disappointment was, there was not even a single tombstone around. We found the base boundary of 2 graves; one of an adult and the other of child. Besides that, there were one or two small part of a concrete pillar lying around not far from the 2 remaining ruins of the graves. The once well-kept pond, was filled with dirty black water. There were houses with people living in it and even a shed where cows were kept. After a few minutes of our presence, a small curious crowd appeared, they were watching us to find out what we are doing there. There was no attempt to establish any communication. One of two of them was dressed better than the others. We were saddened by what we saw, and left with disappointment. Now we wonder if we care enough to do something about it?